A lithium-ion battery is primarily comprised of three parts: the electrodes-cathode and anode-and the electrolyte, usually a liquid medium. As the name might suggest, the primary component of the electrolyte is lithium salt-which cycles between the negative and positive electrodes-carrying charge. Currently, among the most popular electrolytes are LiAsF6, LiBF4, LiPF6, LiClO4, LiN-(SO2F)2, and LiN(SO2CF3)2, all of which contain a halogen, says Puru Jena, a physicist at Virginia Commonwealth University and the lead author of the study. The halogen family consists of elements, including fluorine (F) and chlorine (Cl), which are toxic to humans to varying degrees. Jena and his team found that all the negative ion components of the salts belong to a special class of molecules called superhalogens, predicted by Gennady Gutsev and Alexander Boldyrev in the early 1980s. These molecules form when a metal atom at the center is surrounded by halogen atoms. "Superhalogens are molecules that behave like halogens chemically, but they are much more electro-negative than any halogen atom," says Jena. It should be noted that the term superhalogen is a slight misnomer: there can be halogen-free superhalogens, such as CB11H12, which still act like a halogen with high electron affinity. Jena hoped to create new superhalogens for the batteries, ones that wouldn't have the toxic elements. To understand the fundamental properties of the current halogen-containing electrolytes, Jena and his team created models of all of the popular electrolytes. The models confirmed his suspicions: in fact, the halogens formed superhalogen constructs, which with an extra electron, form closed shells. 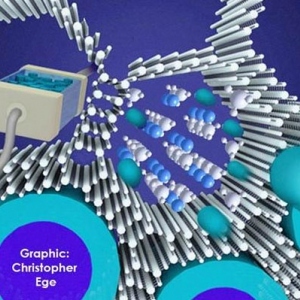 They found that the binding of the Li+ ion in these electrolytes are smaller than that in normal salts such as LiF, making it easier for the Li ion to be stripped away and shuttled between the electrodes. However, there was still the matter of toxicity. Jena points out that in order to remove halogens from the batteries, something equally as efficient at lithium ion transport would have to take its place. He and his team had, in the past, created molecules that acted like superhalogens but which were halogen-free. 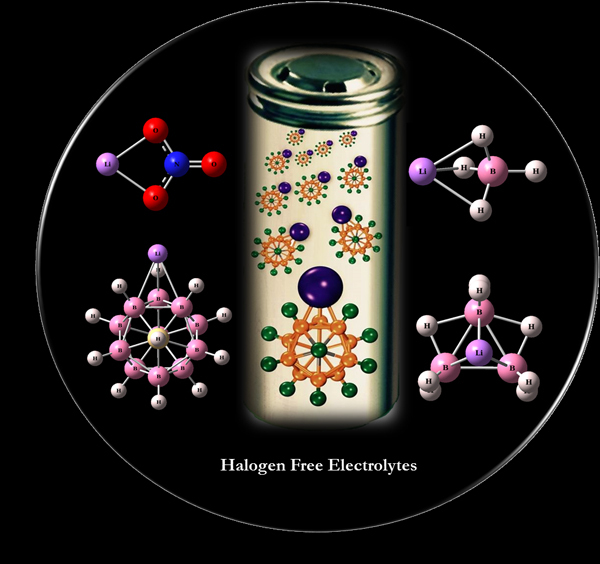 These molecules, including halogen-free CB11H12, could potentially be replacements for halogens-but only if they proved as efficient as current electrolytes in transporting the lithium. "Through modeling, we found, actually, that our molecules were as good, if not better, than current superhalogens," says Jena. In fact, in the halogen-free molecule LiCB11H12, the lithium cation is not only bound less strongly than in the current electrolytes, but also it binds to water less strongly, another important aspect of battery production. A low affinity to water would correlate to longer battery life. "I believe this work may have a profound effect on the development of new lithium batteries," says Boldyrev, now a chemist at Utah State University and is not affiliated with the current study. As a next step, Jena hopes that experimentalists will synthesize some of the halogen-free lithium salts. Assuming a straight-forward synthesis, the salts can then be turned into electrolytes and run through the gamut of tests that any battery would have to perform. If successful, Jena hopes these halogen-free superhalogens might be able to replace their toxic counterparts in the near future.